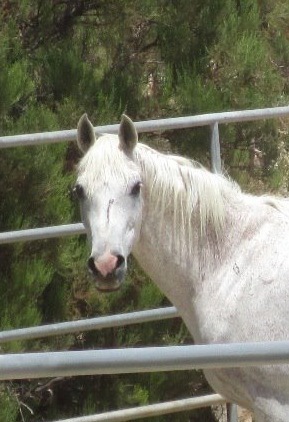 As most of you know, one of my passions are horses, I don't ride much anymore, ever since my beloved Zeppelin crossed over, but his passing led me to the many deserving horses at The Golden Carrot. It was time to go up and check on the guys and gals up there and do some physical labor and get tanned in the process. I feel so good after a day of hard work, it makes you realize that you actually did something else than stare into a computer screen all day. I said hello to Corazon, look at this gorgeous mare, how could you not love her. I worked with four horses in the round pen, Montego (Arab and Ex-Show Horse), Pepe Grillo (Chestnut Pony) and his side-kick Keller (Thoroughbred) they are inseparable, and Dominic (possibly Azteca). Working with them was quite the experience. First to go was Montego! I'm not new to horses, but fairly new to working with them in the round pen and Montego picked up on this immediately. He tried to test me a few times, by trying to change direction, speed and doing anything all together. I had to proof to him first that I was the boss and he needed to do what I told him. I got the hang of it after a few little hick-ups and he worked fine for me. We got him to sweat a little and then he was given a well deserved bath. What a gorgeous boy he is.... and he knows it too! Next were the inseparable duo of Pepe and Keller.... It was clear from the start that the smaller (only in stature not in personality) Pepe was the boss of the two. Both of them also knew what to do in the pen, listened to me very well, but there was no mistaking on who was in front and who was to be behind. If Keller ever got in front of Pepe, he got put in line with a nip to the rear, or got pushed to the fence so he had to fall back. After working up a little sweat, both of the gentlemen got a nice cool shower, while their girls looked on. A couple carrots for each and back into the herd they went..... Nevermind that each of them rolled right after being cleaned. I put the whip on the ground, he would stand there, look at me, come over and just try to nuzzle like a big baby.... panting with anxiety, but a nice hug and soft words, he'd breathe normal in 30 seconds. So it is very clear he is frightened of the whip and I suspect that someone must have beaten him up pretty badly. I tried this out a few times with the same result. Pick up the whip and move it.... PANIC! I want out! Run to gate! Put the whip on the ground, he looks, walks up and nuzzles me, if I move he walks behind me like a puppy. He's a complete love bug that wants nothing more than a person that loves on him... Breaks my heart that he has been mishandled by people he trusted. Shame on you whoever you are! I hope Karma gets you! You can find Dominic's history here! Dominic got his well deserved carrots and a shower and it was time to start putting horses away and preparing feed. The day moved by so quickly and it was time to head home. I wish I'd live closer and I could work with Dominic more, pamper little Shelby and make myself more useful. I'll come back after my travels back home to Switzerland. If you want to help us, consider volunteering your time, donating or sponsoring, if you can spare 3 gourmet coffee's a month.... you'll buy us a bale of hay or a bag of feed! We appreciate it and the horses will LOVE you!